The UF Veterinary Diagnostic Laboratories provide large and small animal veterinarians with accurate and timely laboratory results and phone consultations by board-certified veterinary pathologists. We offer local courier pickup for the greater Gainesville area and $15 flat-rate overnight shipping for Ocala, Jacksonville and all other areas. Call the UF Diagnostic Laboratories at 352-294-4726 for information regarding courier pickup or overnight shipping options. Click here for submission information and forms. The anatomic pathology service provides diagnostic services to large and small animals in the areas of necropsy and surgical pathology. Additional services are offered by dermatopathology. Visit the UF Diagnostic Laboratories Web site for more information. The UF Diagnostic Laboratories work closely with our large and small animal medicine, surgery, dermatology, ophthalmology and reproduction services. The clinical pathology service performs hematology, chemistry, endocrinology, urinalysis, fluid analysis and cytology tests for large and small animals. Visit the UF Diagnostic Laboratories Web site for more information. The risk of infectious disease increases as horses travel. The microbiology, parasitology and serology service provides results to assist in the diagnosis and treatment of infectious diseases to horses and large & small animals. We isolate bacteria and fungus from a variety of animals. 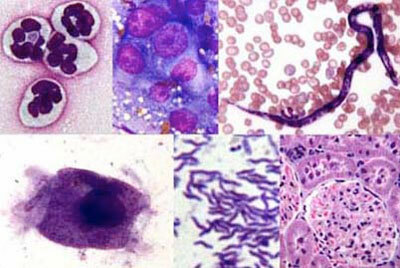 We recover parasite ova and oocysts and identify internal and external parasites. We offer in-house PCR and serology testing and are also familiar with a wide range of serologic tests offered all over the nation. Visit the UF Diagnostic Laboratories Web site for more information. The University of Florida plays an important role in the advancement of veterinary equine care for race horses. The Florida Racing Laboratory is an accredited (ISO 17025:2005) analytical toxicology laboratory that tests samples for prohibited substances and also participates in research, education and training. To contact the racing laboratory call 352-392-2238. The UF College of Veterinary Medicine has diverse areas of faculty research and some research laboratories accept samples for clinical diagnostic testing. Please contact the UF Large Animal Hospital at 352-392-2229 for more information.